Enjoy the Lake District, now a UNESCO World Heritage Site, from the comfort of Lowfold. Located on the edge of Near Sawrey, the home of Hill Top (Beatrix Potter's home), Lowfold, a semi-detached cottage, is within 2 minutes walk of the village pub. 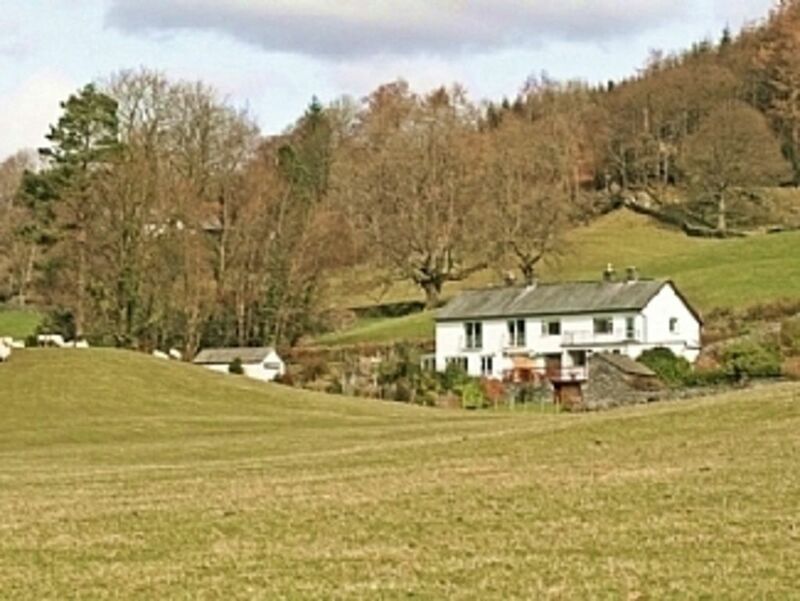 Tranquil Near Sawrey is on the western side of Windermere, two miles from Hawkshead and ideally situated for the Southern Lakes. Lowfold is furnished in a contemporary style and has both oak and carpeted floors. Fittings and furniture include Feather & Black, New Heights and Marks and Spencer. The ‘Shaker’ style kitchen has granite worktops and an oak floor. The lounge/dining room has an open fire with an oak dining table which seats 8. Each room at Lowfold enjoys wonderful lake and mountain views over Esthwaite and the mountains beyond. There are front and rear gardens with car parking for 2 cars together with a decked terrace. Enjoy the peace and tranquility of this magical part of the Lake District. Wake up to stunning views of rolling fields and Esthwaite Water. Walk up to the Tower Bank Arms for local ales and hearty local dishes. Explore Hill Top, Beatrix Potter's home, just a 10-minute walk away. Relax on our terrace with a glass of wine and some good company. We look forward to welcoming you to Lowfold! En-suite bathroom to bedroom 1 with bath, shower, toilet and wash basin. Bathroom with bath, shower, toilet and wash basin. Third toilet and wash basin on ground floor. Washer/dryer located in the kitchen. Log fire in the living room. Basket of logs provided between end of September and March. Strictly 2 cars only in the drive. Parking facilities also available 2 minutes from the house. Lounge/dining room part oak floor and carpet with open fire place. Oak dining table to seat 8. Wall mounted Sky freeview TV, DVD player, CD player and radio, free Wi-fi. Fridge/freezer located in the kiltchen. Tea, coffee and sugar provided for your arrival. Milk delivered daily by our milkman (you will leave payment for this at the end of your stay). Wide range of kitchenware and utensils available. 'Shaker' style kitchen with granite worktops and oak flooring. Cooker, washer/dryer, microwave, fridge/freezer and dishwasher. Balcony at the back of the house. Terrace overlooks fields and Esthwaite Water. Dining table and chairs for outdoor dining. Notes on accommodation: 2018/2019: CHANGE-OVER DAY: FRIDAY Children welcome. Strictly no smoking and no pets. Rental price includes 2 fishing passes for Esthwaite Water Trout Fishery. Enjoy days on the lake fishing with family and friends. VISIT OUR WEBSITE: http://www.lowfoldnearsawrey.co.uk/ Outside: Private garden, sun terrace complete with furniture for alfreso dining, balcony, and lawn. Cleaning / Towels / Linen / Maid service: Linen and towels provided. Cleaned once a week. We will consider shorter stays, minimum 3 nights, during January and February. Please enquire for pricing and availability. A family break with two of our party celebrating birthdays. Great base for driving around the lake district,some lovely walks nearby too.Lovely pub in the nearby village to go for dinner,and Hawkshead isn't too far away. The house was fine for us and,with the weather so cold,it was great to be able to sit by the fire of an evening. Good comms with the owner,and would definitely stay here again! An extremly livable and comfortable Cottage ideal for Christmas. You really are in the heart of the Lakes and Beatrix Potter Country. Sarah and her team were great with our every need including Milk and Firewood. Highly reccomend! Charming house, had everything we needed, bedrooms and bathrooms all gorgeous. The view from the outdoor terrace is stunning. The parking was tricky with 2 big cars tho so we made use of the overflow one 2 mins away. Had a great stay here, handy base for Lakes. Comfortable, spacious, quiet location and lovely view. Thoroughly enjoyed our stay. Lovely views also enhanced by snow and sunshine for us! Cottage has everything you need. Loved the log fire. Beds comfortable and linen & towels high quality. Only v minor downside is navigating the narrow driveway & limited to 2 cars, but parking also available up the road (very close-by). Thanks to Sarah - extremely helpful and responsive. Will definitely book again in the future. Had a great holiday with our two adult daughters,son in law and grandchildren.Fantastic views from the patio and very relaxing watching the sun set.Fully equiped property with an open fire in the lounge, great for lazying around.Situated close to a lovely pub with wonderful food.Plenty of walks and a play area nearby for the kiddies.Just perfect!! Numerous lakes within easy drive including Windermere, Coniston, Esthwaite, Grasmere, Ullswater. Grange over Sands is the nearest beach, approx 20 mins drive. Manchester airport, Leeds Bradford airport and Liverpool John Lennon airport are all circa 2 hours drive away. Own car or car hire essential. Near Sawrey 2 minute walk. Hawkshead 2 miles. Ambleside 6 miles. Windermere 4 miles (via ferry) or drive around the lake. Booking Notes: 25% of the rental fee due at the time of booking with remainder 4 weeks before commencement of stay. £75 refundable cleaning/damage deposit on top of rental rate. We consider shorter stays, minimum 3 nights, during January and February. Please enquire for pricing and availablilty. Changeover Day: 2018/2019: Friday - arrival 4pm, departure 10am. Notes on prices: Prices are for the property per week in UK Pounds.